The painting was created in 1509 – 1511 years. 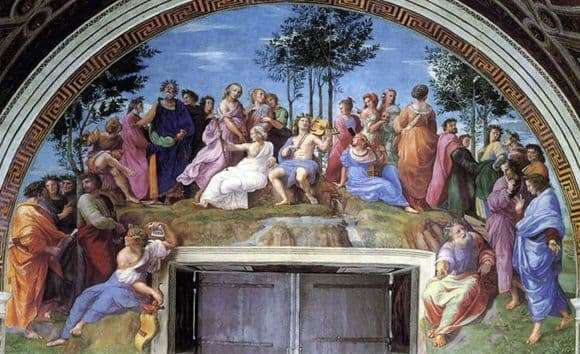 Raphael dedicated his fresco to the everlasting theme of poetry. In the center we see the famous Parnas. Apollo plays the flute. He was surrounded by muses. Each of them in the hands of the subject with which she was usually depicted. All the writers and poets of different epochs gathered here. The painter sought to convey the magical effect of music. He will use this motive in his work more than once. The first attempt he makes is during the creation of Parnassus. This creation combines maximum grace and true greatness. It is difficult to find a more harmonious combination. The composition of the picture is multi-figured. I would like to consider it, figuring out who was honored to be depicted on this genuine masterpiece. In front of the audience, incredibly complex groups of spatial type, formed by sages, philosophers and poets. They are placed among the grandiose landscape and scenery, striking the magnificence of architectural forms. The strict symmetry of the groups placed gives the whole image of the artist a harmonious unity. No feeling of disunity. All the characters are united by an important theme of art and its impact on the person. The richness of colors is impressive. Rafael masterfully registers each piece. For him, portrait resemblance with the people he portrays is most important. This is necessary so that the viewer can understand the idea of ​​the artist. Dresses of people are painted incredibly scrupulously. The folds of the fabric are almost palpable. Rafael shows us his own ideal world, in which only the wisdom of each person, his self-confidence is important. We see what the artist has long dreamed of. A person must be noble and necessarily free. The painting “Parnassus” did not accidentally become a real masterpiece, impressive for any generation of viewers.